This week has been chaotic as usual. Those of you who are longtime blog readers know I consider my youngest a little prophet. Despite our lack of regular church attendance he often tells me about things Jesus has told him. He can "hear church" in his head, he says. The other morning while getting ready for school he randomly informed me that when we are in Heaven before we are born we get to decide how difficult our lives here on Earth will be. I was like, "Um, can I revise that decision?" Evidently I was an overachiever in Heaven! 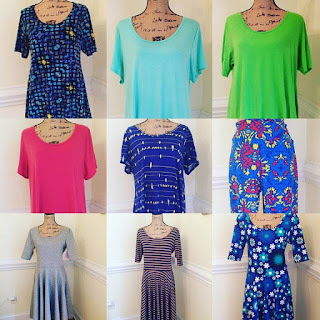 I have LulaRoe Perfect Tees, Classic Tees, and Nicole dresses in sizes L-2X in my eBay and Poshmark shops. These are selling extremely fast, so I recommend you head to the shops to bid or buy if you see some you like. I have only one of each in stock, so you will want to hurry to get your favorite. 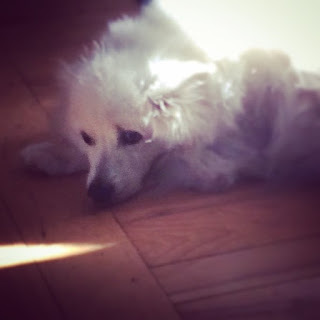 Once we arrived home we could see it was time to "make a decision", as the vet said a few weeks ago, about our 15 year old Eskimo Spitz, Eli. Around April, Eli started dragging one foot and the vet thought it was a loose kneecap. We got him a very expensive leg brace, which he promptly lost or hid. The paralysis spread to his other leg and then to his back. He was too old for surgery. Up until this week he was still his happy go-lucky self. My husband built him a wheelchair and ramp and he used it some although the ramp scared him. However, the pet sitter said he had a "rough" night while we were away and when we got home we could see he had become completely incontinent. He also seemed to be in pain, groaning when we would carry him in and out. I have been holding on to him selfishly, I realized. We got Eli a few months before my oldest started preschool when I was grieving because we had just been informed we wouldn't be able to have any more biological children. My husband got me a "baby", Eli, to make me feel better. Eli represented a time when we were all young, when my son was still healthy, and I didn't want to let go, but I finally understood I was hurting him keeping him here. I couldn't take him to the vet; my husband had to do it. We said goodbye to Eli on Wednesday. I am devastated but my youngest son informs me Eli is running in Heaven and might have already been reincarnated as a new puppy, so that is a comfort. Because we are insane and this wasn't unexpected I have had my eye on a few litters. I saw a shelter dog I wanted but he was snapped up immediately and all the others I looked at said they couldn't be around kids or cats, so they were a no-go. We are going to view the most promising litter tomorrow and I'm getting a little excited about it. Luna, our 1.5 year old Aussie has been extremely clingy and sad lately and I think she will love a new puppy to play with since Eli has been too feeble recently. My husband asked, "HOW long was it before Luna slept through the night?" So, I may be rather incoherent for the next few months from lack of sleep if all goes well tomorrow! Sometimes I think I should breed dogs and cats. I do enjoy them! 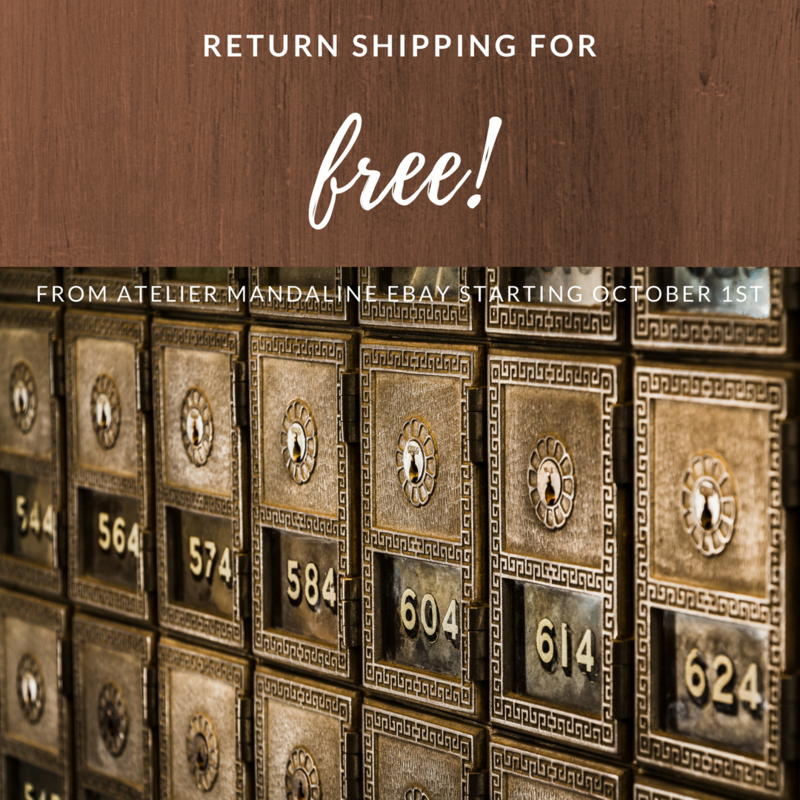 Another exciting event for me is half my orders today came from my website or my Atelier Mandaline Facebook page. I worried my website wouldn't be worth the cost, so if it's going to start paying off for me that's huge. I would so love to have my own freestanding store surpass my shops hosted by other sites! Fingers crossed! Yesterday eBay released their most recent Seller Report and announced a change I've suspected was on the way. Sellers who offer free 30 day returns will receive "increased visibility" for their listings. Those of us who have been on eBay for a long time, 16 years in my case, recognize this for what it is: a mandate. When eBay says sellers who do what they want will have increased visibility, what they are really saying is if you don't follow their preferred action they will hide your listings so no one can see them. Is this legal, when people are paying already to sell on their site? Apparently so. The way eBay comes up with their preferred policies is by interviewing potential buyers about what they would like. Inevitably, the consensus is buyers would like all the newest tech, like phones and tablets, for at least 50% off. Oh, and high-end fashion and handbags, they want that too, starting at like $9.99, and they want it to be authenticated. And they want free shipping, and also free returns for at least 30 days. You know, I would love to get everything for free myself, but it's pretty unrealistic to expect businesses to remain viable if they're giving stuff away all the time. I also wonder how exactly eBay expects sellers to provide these discounts without resorting to outright theft. Sustainable profitability seems to be a completely foreign concept to The Powers That Be at eBay, however. So, I'm trying to be positive about it; what my customers want, they shall get. 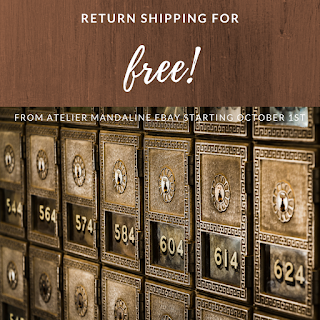 Starting October 1st return shipping will be free for orders from my Atelier Mandaline eBay store. "Free" postage has to be paid somehow, though. I run my business all by myself. I don't take any regular salary; I just use any extra money I happen to make to help out with our household expenses and the rest goes right back onto the business for things like seller fees and inventory. In the past month our broken air conditioner and children's surgeries brought us bills of $10,000. We haven't even received the bill for our Type 1 diabetic son's overnight stay in the ICU or any of his diabetic supplies or doctor visits yet. It was already a challenge for me to provide 30 day returns when eBay mandated that last year. It basically means I can't touch my money for 30 days, even though I have to pay my consignors' shares each month. Now I will have to factor in return shipping. Shipping often costs as much or more than the actual item I am selling and eBay taxes shipping, including it in sellers' "income" when they calculate our fees. ​I was able to avoid raising prices last year by tacking on a 10% restocking fee to returns, but eBay also announced they will no longer allow restocking fees in 2018, so I can't use that option anymore. Therefore, my prices on eBay will be going up at least 10% starting October 1st. If that increase isn't cutting it they could possibly rise even higher. 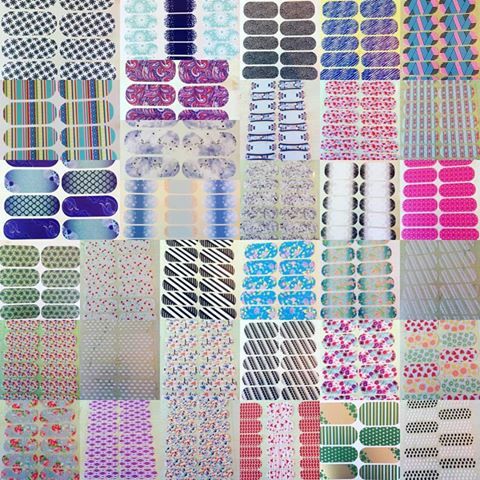 Therefore, if you have your eye on something in my eBay store I encourage you to buy it before October 1st. In other news, there are changes on the dietary front. My husband and I decided to eat the way our diabetic son must eat in order to fully understand his new lifestyle and help him adjust. I am taking it a step further and using diabetic keto test strips and following the original Atkins' protocol, where you start at zero carbs and add until the strips show your blood sugar has risen and you are no longer throwing off ketones. This is not a healthy or safe diet for a Type 1 diabetic, but for me it is a way to understand what my son is going through having to literally measure and test everything he eats. I would also love to lose a significant amount of weight and hope this will help. Today is Day 2 and I feel like total crud. You might remember I was following a 90% vegan diet and the change has torn up my stomach. I've had a constant headache for about two weeks as well, but I think that is more due to stress and insomnia than the diet. I am sharing my journey on Instagram and my Naturally Amanda Facebook page, so if you also follow a ketogenic diet, deal with Type 1 diabetes, or are interested in low-carb dieting for weight loss, please follow me. We can cheer each other on, because y'all, it's HARD. I can't even have wine right now! Change can be difficult, but here's hoping it will be positive in the long run. Since I JUST shared my Poshmark discount code yesterday, today they changed it! 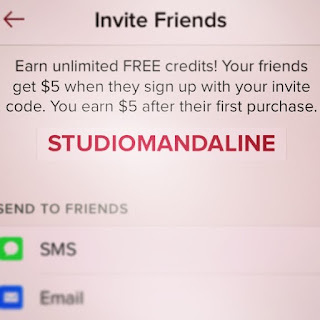 Now get a $5 Poshmark credit when you sign up with code STUDIOMANDALINE, which just happens to be my user name on Poshmark. If you haven't tried it, prepare to get hooked! 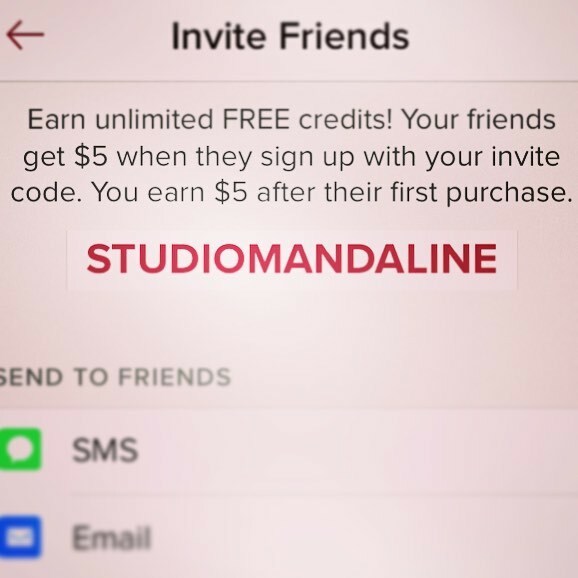 Poshmark makes it easy to share, style, and save on fashion. 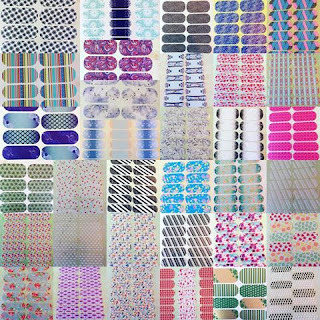 Check out Studio Mandaline for kids' clothes, women's fashions, and Jamberry nail wraps! Sign up for Poshmark using the code NLBOW for a $5 credit. You can make an offer on Poshmark or bundle three or more of my listings and get a discount. Those of you who follow me on Instagram and Facebook are no doubt aware of my absence from the shop this weekend. I am sorry I was unable to write a blog post as well. On Friday afternoon I was working as always: listing on eBay, shipping orders, talking to clients. I was feeling optimistic because I set up a meeting with a new essential oils customer. I had plans to clean the house and harvest some herbs and vegetables before Hurricane Irma's expected arrival. Then I got a text message from my son telling me he was going to the doctor on his college campus due to a long list of symptoms he was experiencing. After that our whole lives were sucked into a whirlwind. Almost immediately my son sent another text to tell me the campus doctor told him to go to the ER. He drove himself, against my wishes. I got in touch with my sister in Asheville, about an hour away from my son but still two and a half hours closer than here. Then I called the pet sitter and found out she was out of town. I got in touch with a friend who agreed to watch our animals. She came by to see where the pet food is kept and find out the routine. My husband arrived home and tried to book a hotel room. My husband and kids threw clothes into suitcases while I rushed to package and ship orders. I threw my clothes into a suitcase. Later I would find I forgot to pack my shoes, my allergy oils, and my Thyromin. We heated some leftovers for the kids, grabbed a couple sandwiches and jumped in the car, leaving a whole sink full of dirty dishes, which was almost painful to me. My sister sent me a text at that point explaining she was with our son and that he was being moved to the Intensive Care Unit. I was in such a state then I doubt I could have recited the alphabet, so it's a good thing my husband was driving. We dropped the younger kids off with my brother-in-law and finally made it to the hospital. Our son was awake and stable, so we were relieved, but shattered to find out he was diagnosed with Type 1 diabetes. Finally, close to midnight, we left the hospital. The hotels were full of hurricane evacuees so we were only able to stay one night near my son and had to crash at my sister's the next night. Our son was discharged from the hospital Saturday morning when they had his blood sugar under control. Because all this happened over the weekend, we were released from the hospital with very little information. The Walmart pharmacist in Sylva was incredible and gave us a demonstration of all my son's new equipment. We spent Saturday in Walmart and a series of pharmacies and diabetic food aisles, our lot cast with the hurricane refugees loading up on air mattresses and ibuprofen and bottled water. I felt a kinship with them, all of us cast like flotsam into the unknown, victims of one kind of storm or another. My sister's family took us in Saturday night and fed us, despite a rather terrifying grill fire. Time for me, since Friday, has just been a blur of sugar counts and carbohydrate counts and doctors and insurance claims and a constant aching worry that my son's insulin levels will spike in his sleep, and make him fall into a coma, that we won't be able to find the money to pay all the hospital bills which have yet to arrive. We arrived home to a kitchen reeking from the unwashed dishes and the unemptied trash can, the stench of life interrupted. 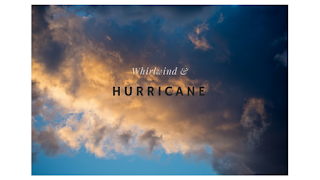 Hurricane Irma arrived here just after us, luckily downgraded to a tropical storm, although our neighborhood pool is now closed after a tree fell on it and I spent a sleepless night listening to the wind howl around our walls. I am just going to go ahead and apologize in advance, because I am going to miss some things, I know it. I will be late to reply to messages or ship packages or "like" your Instagram pictures and Facebook posts or share your Poshmark listings. We will be spending most weekends for the foreseeable future in Asheville to be nearer our son. I was already struggling to keep up with our youngest son's medical schedule and now I have another chronic condition to deal with, this one three and a half hours away. Please be patient with me while I navigate my storm-torn life and learn to transform this terrifying unknown world into my new normal. I want to thank all of you who reached out to us on social media, in texts and messages and phone calls. It was overwhelming and means more than I can say. My son is touched to find so many people all over the world, many of whom we've never even met, praying for him and wishing him well. We send all that love back to you a thousand fold. We wish you well, with all our hearts.